This article has been reposted with permission from Tranio.com. 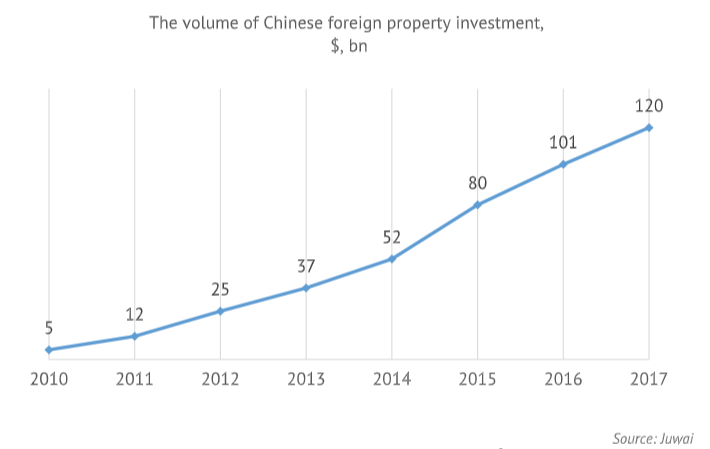 Over the past seven years, China has shown continuous growth in foreign property investment, the majority of which has gone to North America, Europe and Asian countries. In 2017, the volume of commercial and residential property investments grew 18 percent to $119.7 billion, according to China’s largest foreign property web portal Juwai.com. Read on for a look into the property investment details of five of the most prominent Chinese investor markets, according to the Juwai Chinese Global Property Investment Report 2018. The U.S. is the traditional leader when it comes to the volume of Chinese real estate investments. In the past year alone, Chinese investors spent $30.4 billion on acquiring residential assets, while commercial property investments attracted $9.3 billion to the U.S. economy. Chinese investors are mainly interested in purchasing residential property, especially near schools and universities. Buying such property is a ticket into the residency-by-investment program with the further possibility of obtaining citizenship on the table. Chinese nationals obtained 80 percent of U.S. EB-5 visas (a program granting permanent residence for investing $500,000 in U.S. commercial enterprises) issued between 2006 and 2017. But commercial property investments have shrunk over the past year for several reasons, including strengthening capital control and the government’s battle against fund withdrawal from the country. Hong Kong, Asia’s biggest financial hub, has a special administrative status as part of China. The region has relatively recently joined the ranks of the top property investment destinations for Chinese nationals. The breakthrough took place in 2017 when investors from mainland China invested 2.5 times more capital into Hong Kong’s real estate than in 2016. Today, the bulk of investment volume ($16.2 billion) accounts for residential property investments, with $6.9 billion spent on commercial real estate during the year. According to the Nikkei media outlet, this rapid growth can be attributed to several factors, including the growing animosity between Beijing and Washington. According to experts from Colliers International, during trade wars, Chinese mainland investors prefer buying property closer to home. In Europe, a major magnet for Chinese property investments is the U.K. Like the U.S., this country attracts private investors with the opportunity to obtain residency. Chinese nationals receive about 30 percent of the U.K.’s Tier 1 investor visas granted for investing at least £2 million in public stocks or the capital of British companies. In the commercial real estate segment, three-quarters of transactions involving Chinese money feature Logicor, one of Europe’s biggest warehousing operators. In December 2017, China Investment Corporation ended up acquiring Logicor for $14.4 billion. As a result, the Chinese investor began managing about 13.6mn m² of commercial space in Europe. Australia ranked second in real estate investments attracted from China as recently as 2016 but fell behind in late 2017 with the investment volume reduced by 27 percent. Trend changes are associated both with China’s efforts to reduce the excessive capital outflow and tightening certain procedures related to property purchases in Australia. In the second half of 2016, Chinese investors were investing in Australian real estate at an almost irrational pace — it was like money falling from heaven for vendors and developers, Carrie Law, director of Chinese real estate website Juwai, told ABC. “In early 2017, capital controls, financing restrictions, and foreign buyer taxes reduced Chinese investment to more reasonable levels,” Law said. “Australian real estate remains a key destination for Chinese capital,” Michael Zhang, head of JLL’s China Desk in Australia, said. Japan ranks second after Hong Kong in the volume of Chinese investments in Asian property. Recently, investor interest in Japan has been growing given the Summer Olympic Games are to be held in Tokyo in 2020. The certainty of homeowners and tenants in need of housing also makes it a healthy spot for investments: “Although Japan is facing an ageing population issue, Tokyo as the largest city in Japan will still have a large influx of people, guaranteeing housing demand,” the expert asserted. Chengqian Jia, director of Arcion, said what attracts investors to Japanese residential properties is the high rental yields — the South China Morning Post reported that long-term rental yields in Japan range from 4 percent to 5 percent; in Hong Kong, they average 2.6 percent. Elena Trusilina is a Moscow-based real estate writer and content strategist at Tranio.com. Connect with her on Facebook or follow her Twitter.